What they say: A superbly balanced bitter with a prominent hop character. Our most famous and popular brand – it makes up over 90% of our total brewing capacity. 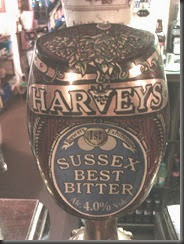 It was only whilst writing up the last beer – Otter Ale – that I realised that I had not yet featured the consistently excellent Harveys Sussex Best. So, it’s fitting that this great local beer is the 100th beer to be featured this year. A cracking bitter, and as a permanent feature in our local watering hole The Rottingdean Club, it sets the standard for any guest beers that may feature. 4.0% A.B.V. The latest guest in our local The Rottingdean Club and my 99th new beer this year. The malt seemed to edge it taste wise and the strength of the beer was clear from the taste. Enjoyable but a couple was enough, although the occasion dictated that I had three! 4.3% A.B.V. The club always has Harveys Sussex Bitter on and it is always excellent so litmus test for any guest beer at the club is whether I would stick with the guest or go back to the Harvey’s. This time around the Harvey’s wins – but not by much. What they say: A truly classic highly popular English session ale made with Best Pale Ale and medium colour Crystal malts. Bitterness is well balanced using English Fuggle and Wye Challenger hops to give a fruity and spicy palate. Like all Hydes classic ales, Original is still dry hopped to the cask at racking with Fuggles to add further aroma and depth. Not sure about the fruity spicy bit but nevertheless I really enjoyed this. Bitter but not to hoppy, this was guesting at what is becoming our regular Thursday night haunt, The Spanish Lady. Again, just a little too cold but otherwise excellent and reasonably priced too – for the south-east anyway! 3.8% A.B.V so a great session beer. The last few days of our Autumn half-term break saw us in Cambridgeshire to catch up with family and friends and staying on a site near the village of Willingham – although sadly not within walking distance. An unexpected – and sadly rather late – find was The Bank micro pub offering half a dozen ales poured direct from the cask. Sadly we only got to try one each but a return visit for Christmas – along with the services of a local taxi – promises more ‘research’ opportunities. As you may have guessed from perfect pint’s description, this golden ale from this young (2012)Lincolnshire based brewery was not really to my taste but I look forward to trying some of their other brews when the chance arises.